Miniaturized semiconductor devices with energy harvesting features have revolutionized the way wearables use energy. Thermoelectric systems play a crucial in this context. But with accelerated trends in device miniaturization, the ability to maintain large temperature differences across device terminals remains increasingly difficult to achieve. 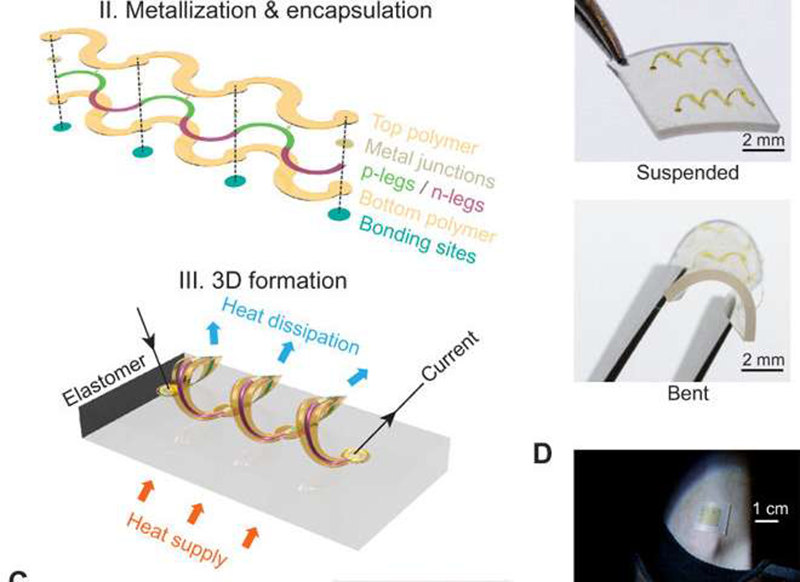 To solve this problem, a team of scientists developed a system in which engineered thin-film active materials are integrated into flexible three-dimensional (3-D) forms. The study, conducted by conducted by Kewang Nan and colleagues, was published on the journal Science Advances. To operate wearable sensors or IoT devices, the temperature gradient between the surrounding environment and the human body/inanimate objects should provide small-scale power supplies. For their study, the researchers built interconnected arrays of 3-D thermoelectric coils with microscale ribbons of the active material monocrystalline silicon. Quantitative measurements and simulations were conducted thereafter to establish the basic operating principles and key design features of the strategy. The results suggested a scalable strategy to deploy hard thermoelectric thin-films within energy harvesters that can efficiently integrate with soft material systems including human tissue to develop wearable sensors in the future, reports Phys.org. The approach enabled efficient thermal impedance matching, and multiplied heat flow through the harvester to increase efficient power conversion. The thermoelectric helical coil architecture was fabricated using monocrystalline silicon as the active material. The mechanically guided assembly generated 3-D helical structures from 2-D serpentines via compressive buckling. Although heavily doped with silicon, the 3-D coils were able to provide remarkable levels of mechanical compliance and robustness during handling and bending applications. Such material characteristics made the system well-suited to form intimate thermal interfaces to the human body, such as the wrist or ankles. The researchers say additional studies are needed to determine the deposition methods, doping and patterning for organic and composite materials. The materials should not succumb to electrical resistance during mechanical transformation from 2-D to 3-D. 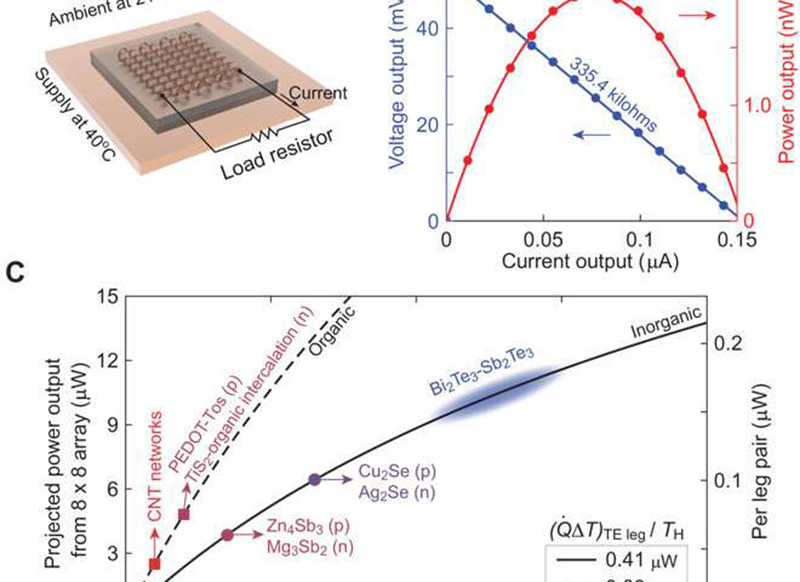 The study opens door to a promising strategy to integrate thin-film materials in harvesters with soft material systems (including human skin) to realize energetically optimized wearable electronic devices in the future.